Stak Bots, a lovely robot fighting card game that I previously reviewed, is currently running a Kickstarter for their newest expansion pack: Purple. Much like the previous version of this game, you can play the expansion as a standalone game or you can play with it added to the original deck, or any number of the expansions you have. This new version of the game comes with 60 cards and 16 new bots to play with. These bots are quite adorable, some looking like a playground slide or a goat, while others look like strange creatures waiting to nibble at you. Apart from all of these new characters, the game adds a ruleset for two new modes of play, both aimed at more advanced players and both limited to being one player vs one player. 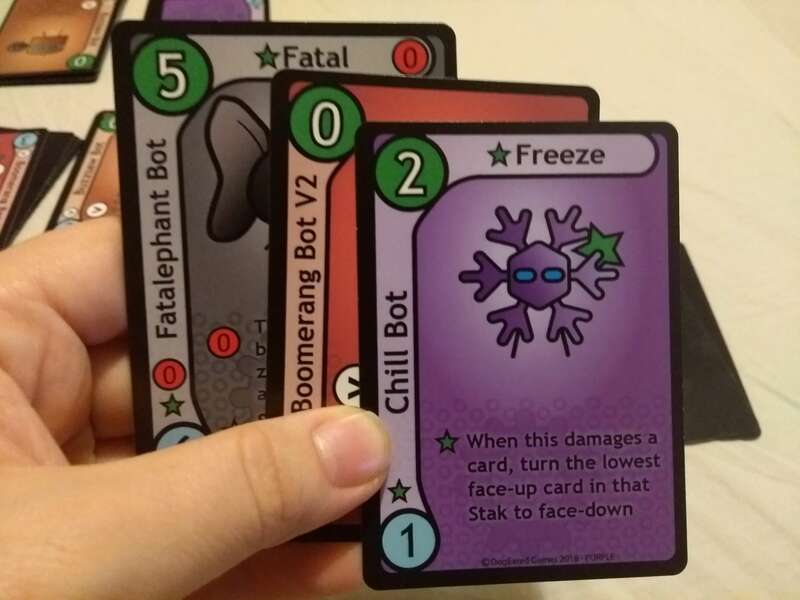 In the original version of Stak Bots, the cards that you end up playing with are random — not allowing for a lot of customization to the game. With Purple, you can play two new deck-building focused modes. The first of the modes allows players to ‘purchase’ cards with a pre-set amount of points. Each card has a blue number on the bottom showing the card’s worth. One by one, everyone takes cards from six stacks until they have a total number of 24 points. Once they have their decks, the game begins. Then the game plays as normal apart from reactive play being enforced. Reactive play is optional in the original deck, and basically allows for the player being attacked by an enemy to defend themselves with a card from their hand. This makes turns move faster as the goal is to make someone lose all of their bots. 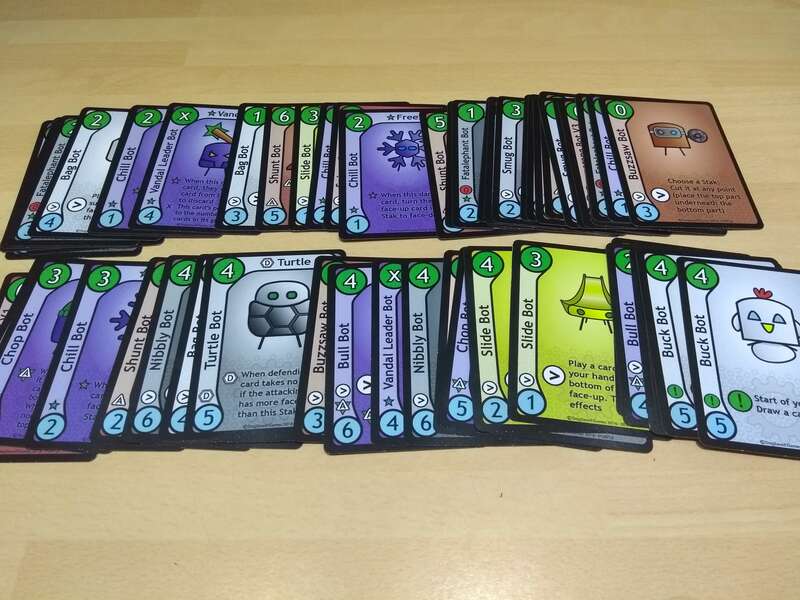 Once someone has won the game, that person gets 2 points to spend in the shop and can upgrade a maximum of 1 card, while the loser gets 4 points to spend and can upgrade a maximum of two cards. The first person to 4 wins is declared the overall winner. This mode of play starts off very quick and soon becomes longer and more challenging. When spending your points you need to really think about the number of cards you have overall as well as the types of bots you’ve picked. Playing reactively also forces you to be constantly aware of abilities and the cards being thrown at you. Once you have won or lost a few rounds — and have more cards in your hands (as well as more powerful cards) — the game starts to really flow and there is more gameplay between rounds. The second new mode is Split Drafting Mode. Instead of spending points in a shop to gain your cards, you end up with a deck half selected by your enemy and half selected by you. Each player will need to pick 12 cards — two cards of each rank from rank 1 to rank 3. You will be picking one card to keep, which ends up in your hand, and one for your opponent, which will go in front of you. You will then repeat this process with ranks 4 through 6 and then you have your decks. The game continues forward from here as normal. 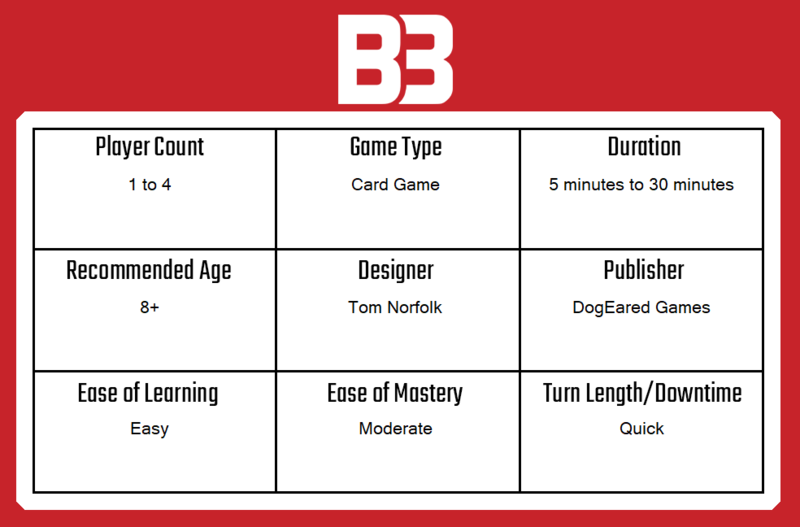 You will play with your drafted cards until someone wins a total of 3 rounds, then you can start again. Both of these playmodes add an interesting and intense twist to the game — especially for those who have mastered the default way of playing Stak Bots. As for me, I quite enjoy the default playmode, however, I found that these new bots were a great addition to my deck regardless, and will be playing with them in the future. That’s the cool thing about Stak Bot’s expansions. You can play them as a stand alone game, play them as new bot additions to your base game, or play their new modes — it’s all completely up to you. If Stak Bots sounds interesting to you, consider backing their Kickstarter where you can pick up any color set of Stak Bots for just £8. A copy of Stak Bots: Purple was provided for preview purposes by the developer, DogEared Games. You can find out more information on their games by visiting their website.